Things were going so well and then in a flash, the Atlanta Dream’s season was over. After a Game 1 victory in Indiana, the Dream took home-court advantage and control of the series. Tamika Catchings played like the MVP-candidate she is in the final two games of the series. Catchings torched Atlanta for 25 points and 13 rebounds in Game 2, as Indiana evened the three-game series. The 11-year veteran forward added 16 points and 11 rebounds in the series-clinching win in Game 3. This series proved to be a microcosm of Atlanta’s entire season. The Dream played well and was in position to win, but in the end, the Fever were just too much to handle. Game 3 was there for the taking, as Atlanta tied the game at the half, but a 6-for-18 shooting performance in the fourth quarter was the Dream’s undoing. Angel McCoughtry scored just 16 points and only two in the second half on 7-for-21 shooting. That, along with being out-rebounded by 15 boards, was the reason for the Game 3 loss. However, Atlanta would not even have been in the postseason without the stellar play of its superstar forward all year long. It was a disappointing end to the 2012 season, but McCoughtry still had an MVP caliber season, leading the league in scoring at 21.4 points-per game. 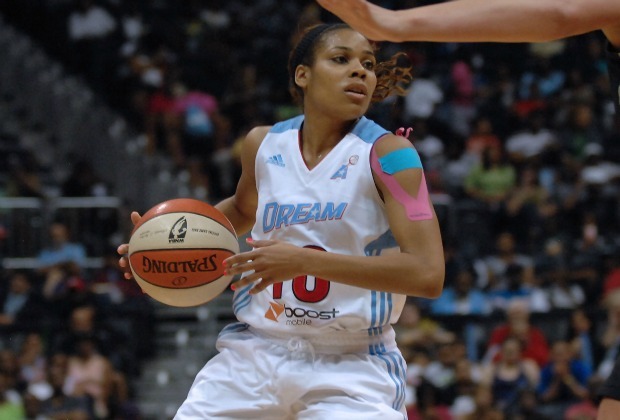 Lindsey Harding led the team in scoring and assists throughout the series with 19 points per game and 5.3 assists. Harding felt her team had to adjust to the playoffs, but wasn’t getting as many calls in Game 3. In other news this week, the Dream named Atlanta business executive and community leader Ashley G. Preisinger as team CEO. Preisinger comes to the Dream after leading Homrich Berg, an independent wealth management firm where she was Director of Client Development and Marketing since 2008. Currently, Preisinger is on the Board of Directors at Zoo Atlanta. Her role for the Dream will be to oversee finances, sales and basketball operations. “I look forward to using the experience I’ve gained as an executive and active com- munity member in Atlanta to compliment the Dream’s terrific on-court success,” Preisinger told the team website.